Amer Picon has been a well-kept secret love among bartenders, and it has been common to request bartender friends traveling abroad to bring back the liqueur. It has been almost impossible to procure in the US, prompting such articles as “What is Amer Picon? How to Find the Elusive Aperitif” on SpruceEats. The overall on Amer Picon is that it is a bittersweet amaro dating back to 1837 with a dominant orange flavor, but a back palate that includes genetian, quinine, and other common amaro herbs. 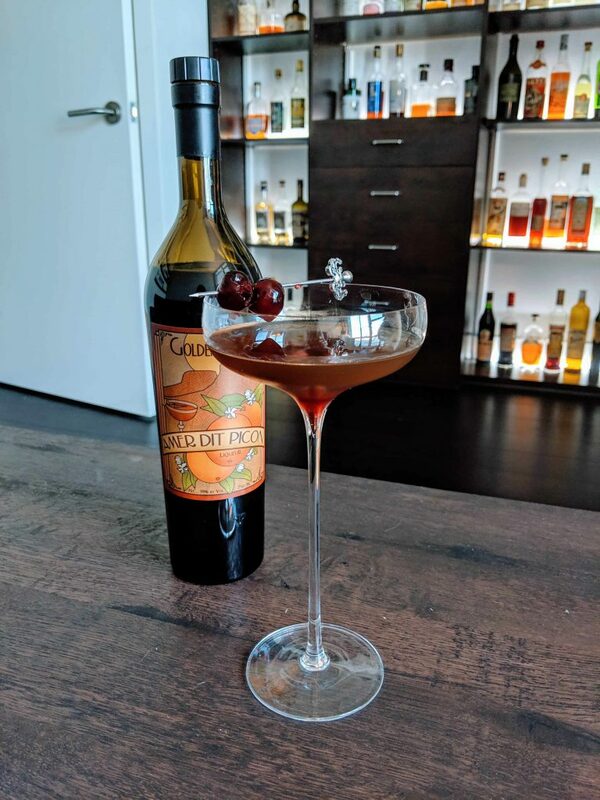 Due to its scarcity, there have been several write-ups on how to recreate Amer Picon for bartenders using an amaro, orange peels, orange bitters, and orange liqueur. But with any pent-up demand, eventually there will be supply! One of these is the offering by Golden Moon, which has (for full historical accuracy) tried to duplicate the original 1830s recipe of Gaetan Picon, who served as the French Army apothecary. The resulting taste is a very dry, genetian-strong taste with strong orange peels. For cocktails, it is fun. We experimented with several cocktails, including an boulevardiers , the “Nirvana”, and the famous “Brooklyn” cocktail, which was originally made for Amer Picon. Our first thoughts out the gate was to create a negroni (which is always a go-to-experiment for a new amaro). Ideally, we should have started out with gin, which pairs nicely – but given our dwindling supply of gin and rapidly growing whisky collection, we tried out a few sweeter whiskies for a boulevardier. Our initial experiments with bourbon turned out a bit off – too oaky and too sawdusty, so we ended up playing around with Japanese whiskies, which are sweet but mellow enough to highlight the picon. We also ratio-ed down the picon so it did not dominate. Stir and strain into a glass. Garnish optionally with Maraschino cherries because they are beautiful and delicious.